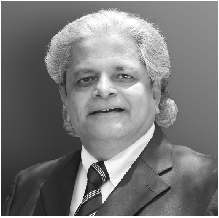 Shrinivas Dharmadhikari is a Global Marketing & Public Policy Consultant with 25 years of experience in regions like Africa (East & West) South East Asia and Europe. He is also a member of the Harvard Business Review Advisory Council. The Insignificant Man: Documentary or Docu-fiction? Demonetisation: "Everybody Has a Plan Till It Gets Punched In the Face"
Who Is Responsible For the Crisis Of Government in Delhi? Who is In Charge of Delhi?